One of the main objectives of the Electrical Alliance is to raise awareness of its apprenticeship program. 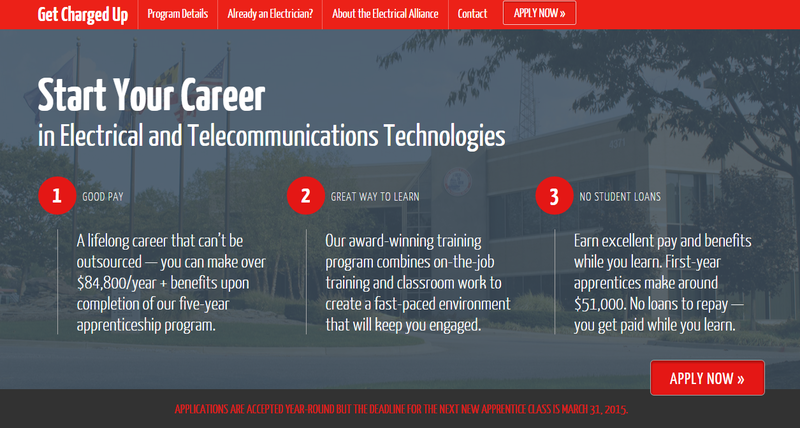 This March, it completed the redesign of GetChargedUp.org as part of its efforts on promoting the Joint Apprenticeship and Training Committee (JATC). The website is one of the main recruiting tools for the JATC program, which provides Electrical Alliance contractors with highly skilled electricians for their projects. Electricians that graduate from the JATC not only have the skills necessary to complete their work, but provide contractors with the confidence of knowing they have been taught the right way, and the safe way to get the job done. The Electrical Alliance is a cooperative effort between the skilled craftsman of the IBEW, Local 26 and electrical contractors of the Washington, DC Chapter of NECA. If you know someone who would make a good electrician, send them to www.getchargedup.org!